Newly renovated country house with 4 bedrooms and 4 bathrooms. "Las Ruinas" is a lovingly restored country house with pool and a 2000 sqm plot in a quiet area of ​​the Costa Blanca. 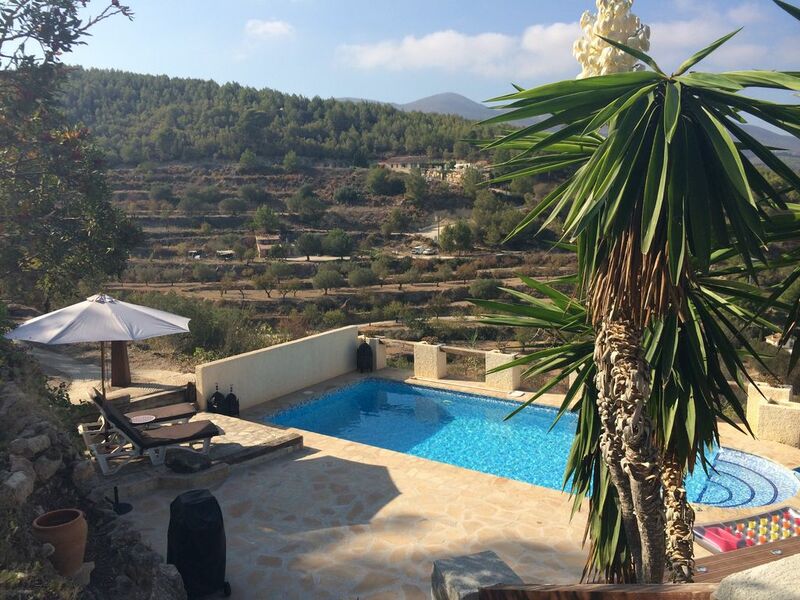 From the private pool you can experience a magnificent panoramic view of the valley. The approximately 150 square meters rustic finca is fully renovated and tastefully decorated in country style. Here are up to 8 people to spend a dream holiday. The house extends over 2 floors and consists of a central living room with a dining room, a living room, a fully equipped kitchen, 4 separate bedrooms with private bathrooms and many terraces to enjoy different views. Upstairs: 2 bathrooms with shower, sink, toilet. 2 bedrooms with double bed and separate terraces. On the ground floor: A spacious, fully equipped kitchen with pantry and dining room. A living room with TV. 2 bathrooms with shower, sink, toilet. 2 bedrooms with double bed. Access to 2 separate terraces. In the storeroom: A washing machine. Large terrace with barbecue, patio furniture and 2-3 parking spaces in front of the door. The nearest beaches can be reached in about 10 minutes by car. - Final cleaning including key collection: 125, - € / entire house. 3 veranda in different sky orientation. All partially covered. Everything we needed was catered for. Brilliant outside area, lots of space excellent pool. Quiet location yet only 10 minute drive to Calpe and a lot to do within driving distance. Really nice place to stay, very peacefull and pool area is great for relaxing with the family. Ein großzügiges, in modern rustikalen Baustil errichtetes Haus mit ausreichend Platz und großer Poolanlage. Die Bäder sind modern und funktional ausgelegt, sodass wir diese mit 6 Personen parallel nutzen konnten. Die Küche ist praktisch angelegt und verfügt über eine reichhaltige Ausstattung. Der vorhandene Weber Gasgrill rundet die Sache ab. Die hintere Terrassentüranlage ist bei stärkerem Regen leicht undicht. Die Vermieterin war bei Fragen im Vorfeld sowie vor Ort immer erreichbar und hat sich immer des Themas angenommen. Wir werden sicher wieder hinfahren. The region (Costa Blanca) is accessible by 2 airports: Alicante 80 km and Valencia 110 km away.